Description of the Item, Model, Serial Number, Date Purchased, Warranty Expiry Date, Purchased From (The Original Supplier), Quantity, Purchase Value, Purchase Currency, Replacement Value, Replacement Currency, Location, A Picture of the Item and a Picture of the Proof Of Purchase. The initial screen will display a list of the Items which have already been captured. To add a New Item, touch the ‘+’ button in the top right-hand corner. Under the ‘Item Picture’ block you may capture a photo of the Item by touching the ‘Take A Photo’ button. Once presented with the image you can choose the image by touching the ‘Use Photo’ button or you may retake the photo by touching the ‘Retake’ button. Alternatively if you have a picture of the Item on your device you may capture the image of the Item by touching the ‘Pick From Album’ button. Under the ‘Proof Of Purchase’ block you may capture a Proof Of Purchase or Payment Receipt of the Item by touching the ‘Take A Photo’ button. Once presented with the image you can choose the image by touching the ‘Use Photo’ button or you may retake the photo by touching the ‘Retake’ button. Please note all the fields below with the exception of the Date fields and the Currency fields have a ‘clear button’ marked with a small ‘x’. If you want to overtype or delete the contents of the field then touch the ‘x’ before capturing the details. Type the description of the Item next to the ‘Description’ label. Type a description of the Model of the Item next to the ‘Model’ label. Type the serial number of the Item next to the ‘Serial No. label. At the Date Purchased field, select the Date on which the Item was purchased and touch ‘Done’ in the Calendar pop-up to complete the selection. At the Warranty Expiry Date field, select the Date when the warranty on the Item will expire and touch ‘Done’ in the Calendar pop-up to complete the selection. Type the name of the supplier where the item was purchased next to the ‘Purchased From’ label. In the case of a gift this field may be left blank. Type a number into the field next to the ‘Qty’ label. Type the price you paid for the item next to the ‘Purchase Value’ label. In the case of a gift it may be left at the default value of 0.00. At the ‘Currency’ field next to ‘Purchase Value’, select the appropriate currency which was used to purchase the Item. The default will be the currency of the current locale of the device. Touch ‘Done’ in the Currency pop-up to complete the selection. Type the price you are likely to pay to replace the item next to the ‘Replacement Value’ label. At the ‘Currency’ field next to ‘Replacement Value’, select the appropriate currency which was used to purchase the Item. The default will be the currency of the current locale of the device. Touch ‘Done’ in the Currency pop-up to complete the selection. In the ‘Location’ fields, type a description of where the Item is located. It may be something like ‘Sitting Room’, ‘Bedroom’, ‘Garage’ etc. To save the Item, touch the ‘Save’ button in the top right-hand corner of the screen. 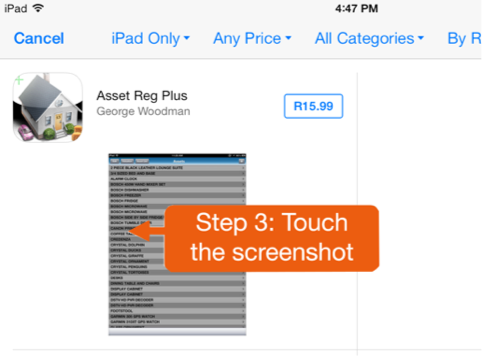 Alternatively, to discard the details, simply touch the ‘Assets’ button which will take you to the start screen. On the start screen the following may be done. To delete Items, touch the ‘Edit’ button in the top left-hand corner of the screen. You may then delete and Item by touching the ‘-‘ button to the left of the Item and then touch the ‘Delete’ button which appears to the right of the Item. Touch the ‘Done’ button to exit the ‘Edit’ mode and return to the normal start screen. To amend an Item simply touch the Item and the Item Detail screen will be displayed. You may then amend any of the fields on that screen and touch the ‘Save’ button to capture your changes. ‘Valuation’. This will display a listing of the Items and includes the Description of the Item, the Purchase Value of the Item, the Replacement Value of the Item and includes Totals on the last page. Touch the ‘Done’ button at the top left-hand corner of the toolbar to return to the start screen. 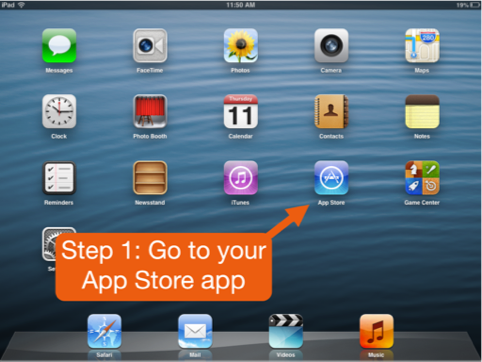 Touch the printer icon to print to an AirPrint capable printer (NOTE: you must have an AirPrint capable printer available to use this option). Touch the mail icon to email a copy of the report to a recipient. If the toolbar is not visible then simply touch the body of the report and it will be redisplayed. ‘Asset List’. This will display a listing of the Items and includes the Description and Serial Number of the Item, the picture of the Item if one is available, a picture of the Proof Of Purchase if one is available, the Purchase Value of the Item and the Replacement Value of the Item. Touch the ‘Done’ button at the top left-hand corner of the toolbar to return to the start screen. Touch the printer icon to print to an AirPrint capable printer (NOTE: you must have an AirPrint capable printer available to use this option). Touch the mail icon to email a copy of the report to a recipient. If the toolbar is not visible then simply touch the body of the report and it will be redisplayed. ‘Export To CSV’. This will produce a list of the Items in comma separated value format so it may be opened in a spreadsheet program such as Apple’s Numbers application and includes the Description, Model, Serial Number, Purchase Value of the Item and the Replacement Value of the Item. The email composition screen will appear with the CSV file as an attachment. Complete the email message and touch ‘Send’ when complete, or ‘Cancel’ if you want to discard the report. ‘Cancel’ will close the ‘Options’ menu. Thank you for purchasing AssetRegPlus and if you are satisfied with your purchase I would appreciate it if you would please post a rating. 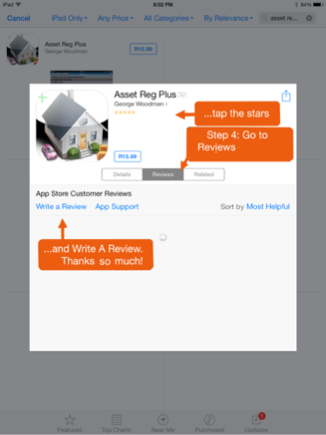 See below for details on rating the app and posting a review. 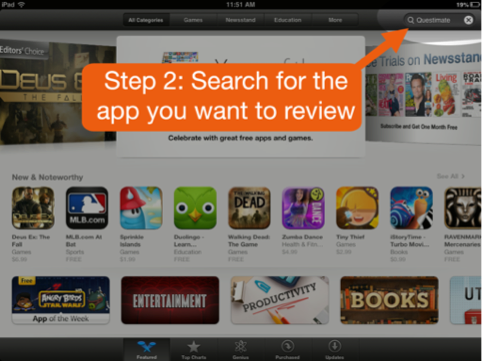 How To Rate An Application.